Our Amish Galena Dining Room Chair glistens with its American-made features that will add shine to your living space. 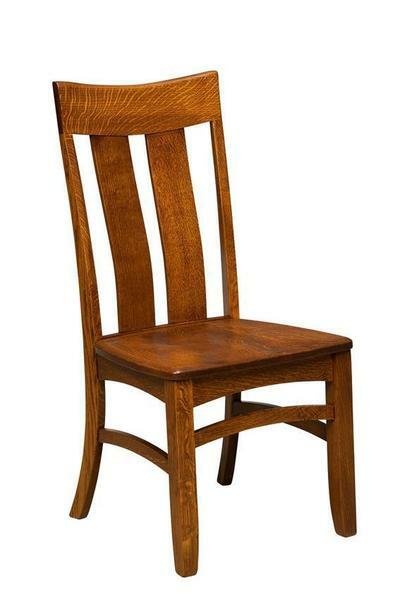 This unique dining room chair is shown in quartersawn white oak wood with Michael's cherry stain. Customize yours using our various wood and stain combinations that can be viewed by scrolling down. The Galena offers a chair back defined by two extra wide slats that cradle you in comfort as you enjoy meals at the kitchen table or in your festive dining room. With Amish construction providing the strongest, most durable dining chairs, the Galena is one that is sure to last for decades. We offer the Galena in a matching stationary bar stool and swivel bar stool as well. Be sure to view the gorgeous Amish Galena Trestle Table for a complete set. Consider upholstering your contoured seat in a wide array of leather or fabric choices. Or supply your own material. Many of our customers choose to send their own fabric in. The Amish woodworkers who make the dining chairs for you are more than happy to accommodate your choices. Give us a call at 866-272-6773 with any questions that come up. We would love to help you get an order started. Thank you for shopping with DutchCrafters.